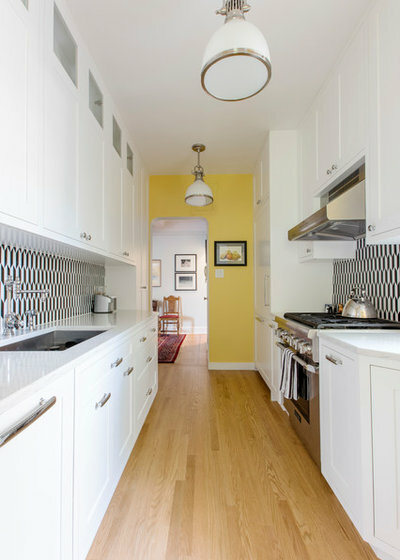 Adding a patterned tile to your neutral kitchen can give it color and personality. 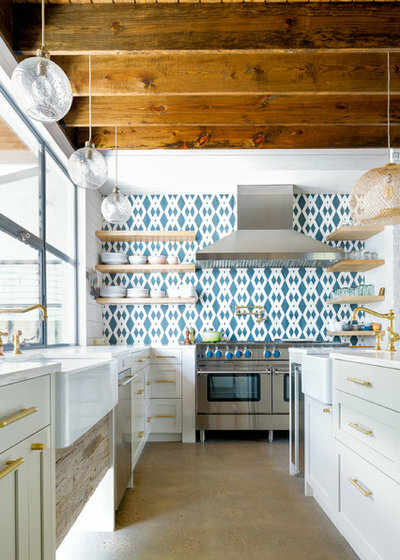 This blue-and-white tile pops against soft gray cabinets, white countertops and dramatic wood ceiling beams. 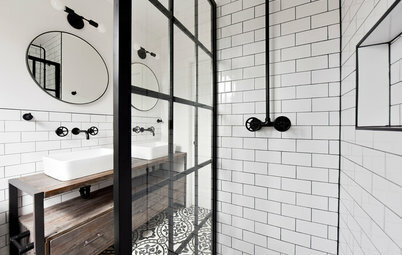 Gold fixtures and cabinet pulls further liven up the space. 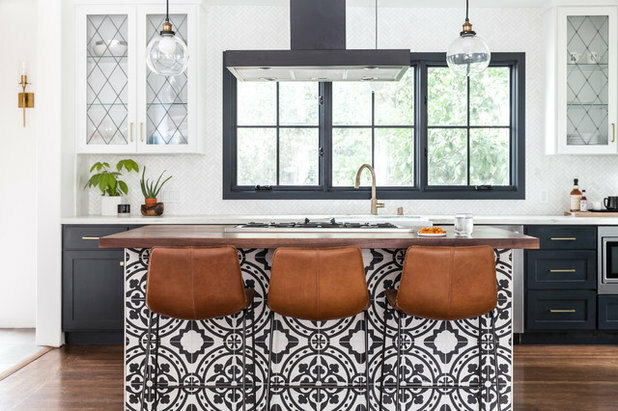 Patterned tile isn’t just for backsplashes — you can add it to a floor or even the back of a kitchen island, as shown here. I recommend that you keep other textures and decorative shapes in the room to a minimum so they don’t compete with your patterned tile. 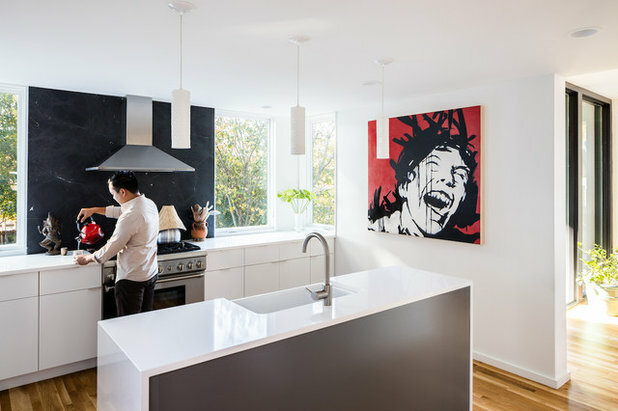 In this kitchen, the high contrast between two neutrals — white on the upper cabinets and black on the lower cabinets, range hood and window frames — creates a tension that also helps make the room interesting. 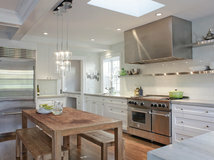 Kitchens are often overlooked as places to feature a piece of art. But people spend quite a bit of time in these spaces, which makes them perfect backdrops for a favorite artwork. To protect your art, place it in a frame if appropriate. Hang any unframed pieces away from the stove or any water source. A gallery wall brings personalized style to a kitchen from Folkway Design & Wares that has neutral cabinets, countertops, flooring and walls. 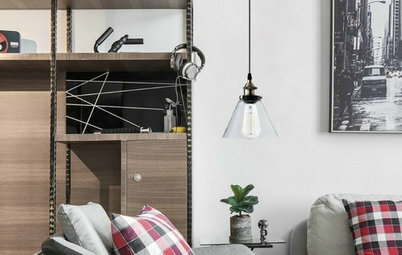 As an alternative to hanging the artwork, you could lean several pieces on a shelf and add a sprinkling of attractive kitchen accessories so that they, too, become part of the decor. 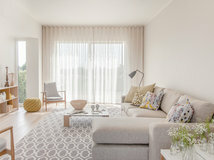 Wallpaper can have a big effect in any room. 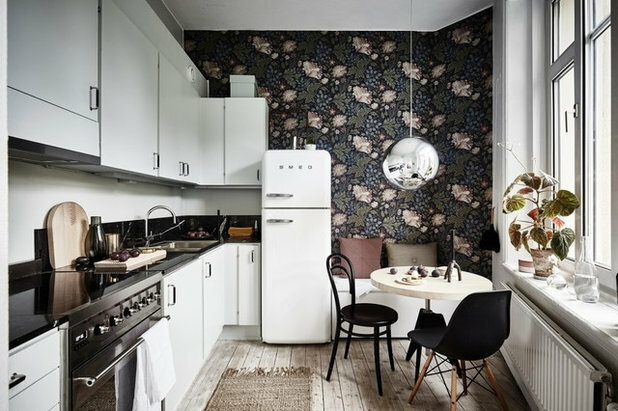 This traditional floral wallpaper adds visual interest to a kitchen that has simple white cabinetry, black countertops and rustic wood floors. Look to vinyl or wipeable wallpaper that you can clean with a damp rag. As with art, I recommend hanging decorative wallpaper away from the stovetop or water to avoid mildew or potential fire hazards. 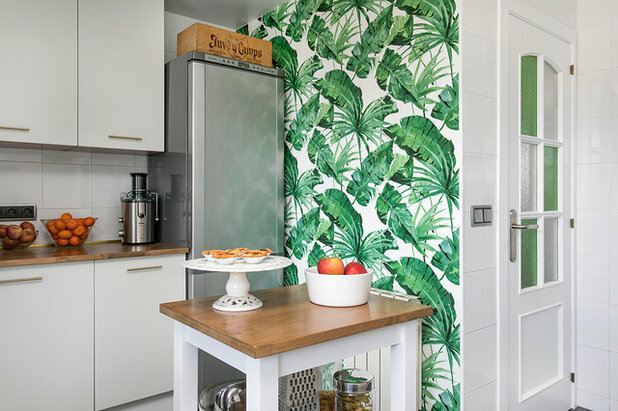 In this kitchen, dramatic and playful botanical wallpaper helps define a portion of the room as its own functional zone with a small island. Window treatments can dress up a room in the same way that a beautiful scarf elevates a plain outfit. 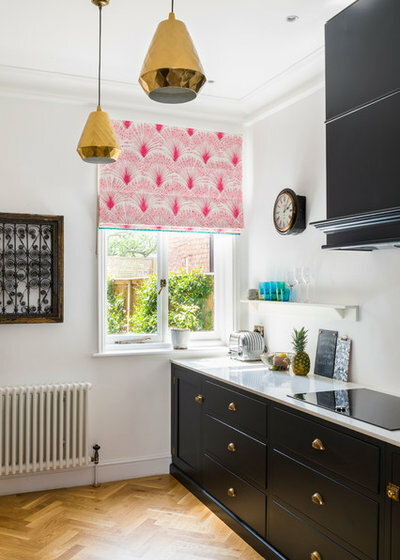 A pink patterned Roman shade brings a pleasant punch of color to this kitchen. 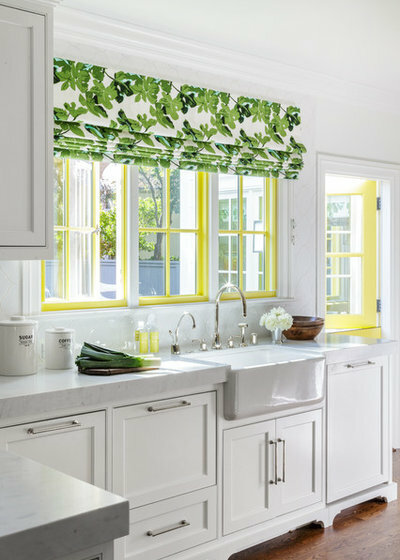 This green floral Roman shade livens up the neutral kitchen in a home remodeled by Patriarch Architecture. 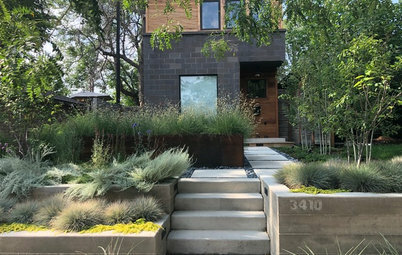 Cheery yellow window casings and a matching Dutch door also help. When using window treatments to pep up a neutral kitchen, I recommend taking one of two approaches. One option is to coordinate your decorative shade with accessories in similar colors. 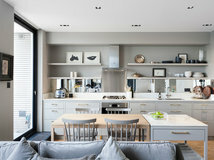 The other is to limit the color and pattern in your kitchen to just the shade, window and doors, as shown here. 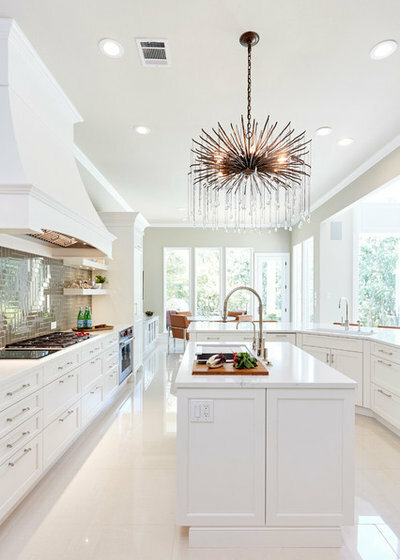 Getting creative with light fixtures can amp up your neutral kitchen’s style, whether you choose one light over an island, as in this kitchen from Shylo Preston, or several fixtures throughout the kitchen. 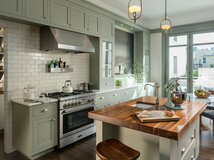 Consider unique shapes or dazzling finishes that will stand out against the plain backdrop of your kitchen. 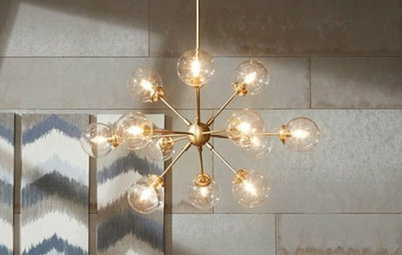 For a more cohesive look, try coordinating accessories or a piece of furniture with your statement light fixture. 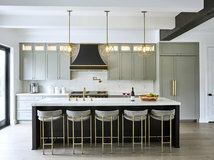 In this wood-and-white kitchen from Allison Crawford, the gold legs of the bar stools nicely coordinate with the glamorous gold chandelier. 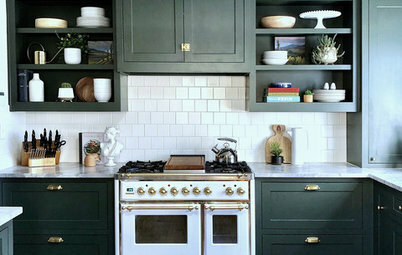 Painting an accent wall is one of the simpler ways to add personality to a neutral kitchen. 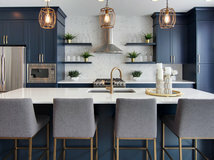 To get enough impact, choose a color that pairs well with, but still stands apart from, the other finishes in your kitchen. 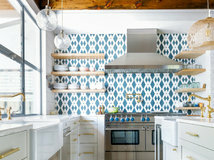 This neutral kitchen also benefits from one of the other ways to jazz up a neutral kitchen: the patterned tile backsplash. 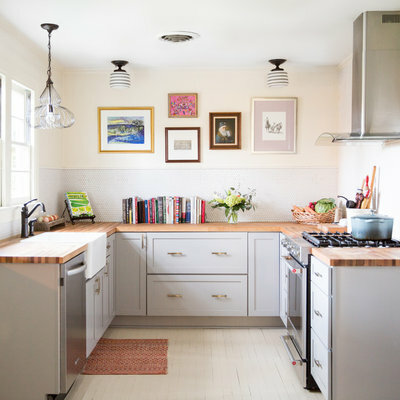 In this kitchen, a pretty lavender coats the walls and ceiling. The shade is a surprising and refreshing companion to the taupe cabinets. 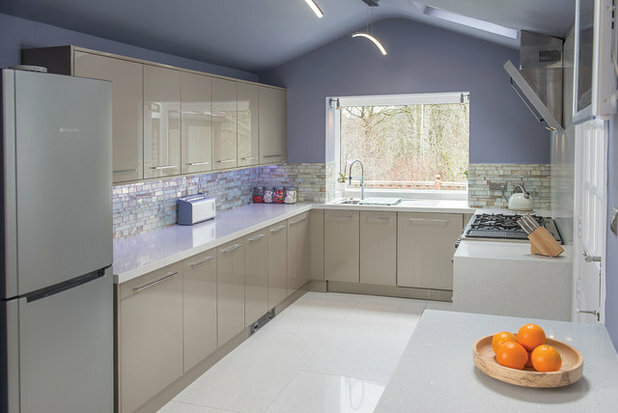 With the light hitting the shimmery backsplash, it nicely reflects the purple hue. 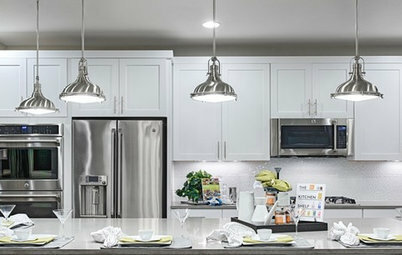 Adding pops of color through accessories is another simple way to dress up a neutral kitchen. You might place playful, colorful accents throughout your kitchen — try a kettle, boxes, canisters or vases. 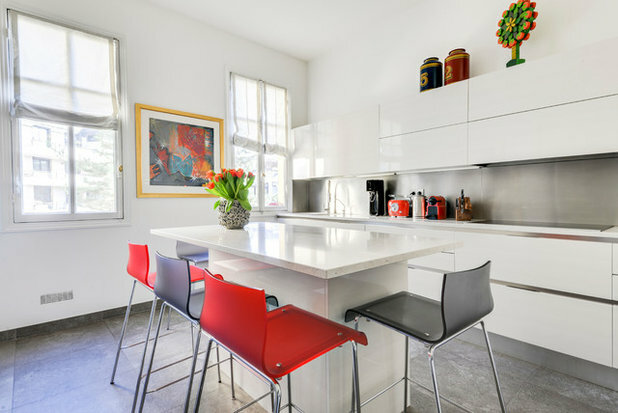 The bar stool upholstery adds an invigorating zing of color to this white kitchen by Pinney Designs. 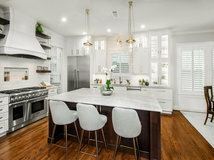 Coordinating your colorful kitchen accessories with your bar stools, artwork and even fresh produce and flowers will make your kitchen look picture-perfect. A little bling goes a long way, especially in the kitchen. 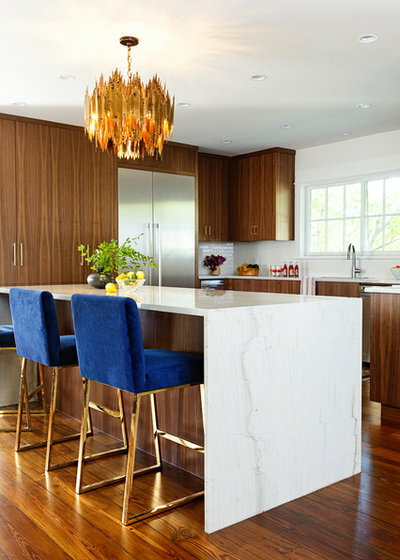 Adding gold accents in the form of cabinet pulls or bar stools can give a luxe look to the plainest kitchen. 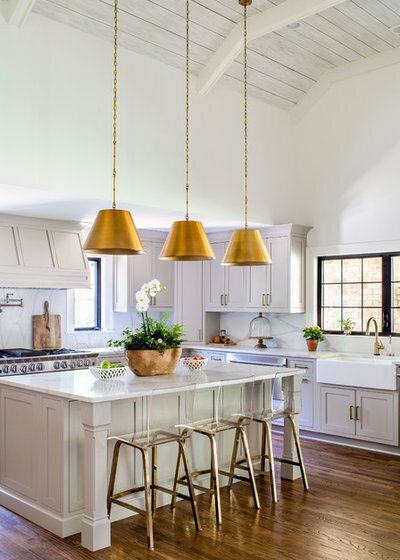 The three pendants over this kitchen island bring in an energizing dose of gold. 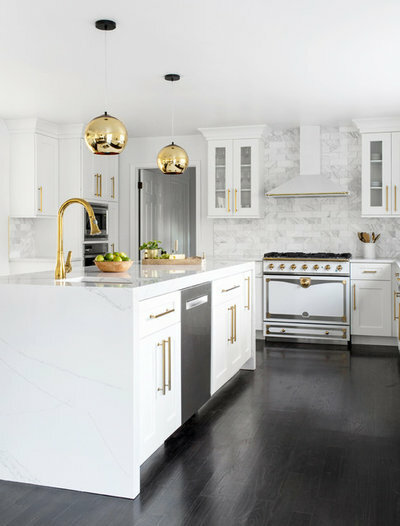 These gold pendants lend a tasteful touch of glamour to a mostly white kitchen. 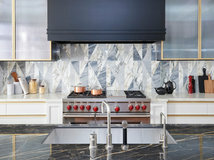 The gold cabinet pulls, oven knobs and sink faucet coordinate with the lighting finish to give the kitchen unmistakable style. Since most people spend a lot of time in the kitchen, do what makes you happy. Personally, I hate all of these. Esp. the open shelves. LOL, I'm not tidy enough. My own kitchen would probably be hated by most; cherry cabinets, stainless, black leather granite, white oak wood floor, soft green walls. 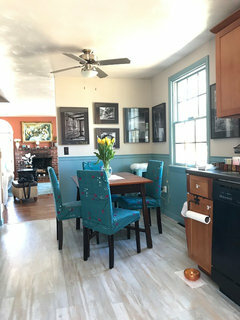 We love it, and it makes me happy to cook there.